There is an almost universal fascination with the American ghost town, those empty places where the wind swirls dust along once busy streets and sun bleached signs appear as portals into a world now vanished. What is the lure of places that stand as silent monuments to shattered dreams? The ghost towns of the southwest, and along old highways such as Route 66, generally fall into two categories. One is the pure ghost, towns with a population of zero where the surviving remnants are at the mercy of the vandal and the elements. As I learned in the writing of Ghost Towns of the Southwesthttp://rcm.amazon.com/e/cm?t=1968adventurer&o=1&p=8&l=bpl&asins=0760332215&fc1=000000&IS2=1&lt1=_blank&m=amazon&lc1=0000FF&bc1=000000&bg1=FFFFFF&f=ifr, and Ghost Towns of Route 66, these are places as fragile as spring flowers in the desert. Towns that twenty years ago were filled with skeletal buildings lining brush choked streets are today little more than faint foundational outlines in thick brush nestled amongst stunning landscapes. In many of these even the most creative imagination will have difficulty visualizing this empty place as a once bustling center of commerce with a bright and prosperous future. The second type are those that have survived as artist colonies or recreations, a romanticised manifestation of what people expect to see in a ghost town. These often stretch the concept of ghost town and a more apt descriptor might be shadow towns as they are mere shadows of what once was. Tombstone, Oatman, and Jerome in Arizona, and Calico in California, would fall into this category. Chloride, northwest of Kingman, exemplifies the ghost town that falls somewhere in between. The empty railroad depot with the snow covered Cerbat Mountains as a backdrop, the wind swept cemetery with its century old head stones, and the often empty “downtown” intersection, hint that this village was once much more than a haven for retirees and eccentric artists. Chloride rates high on my list as a place to savor solitude and allow the imagination free reign. 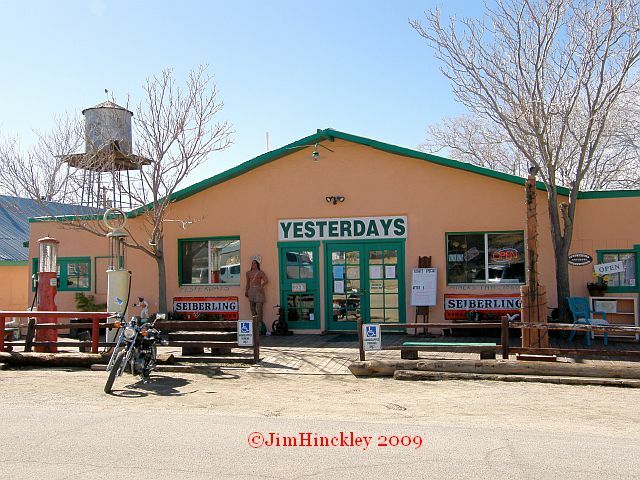 Its close proximity to Kingman, and the excellent food in a pleasant atmosphere at Yesterday’s Restaurant, make it one of our favorite places for a quick get away. Hackberry, east of Kingman along Route 66, is less than a wide spot in the road. 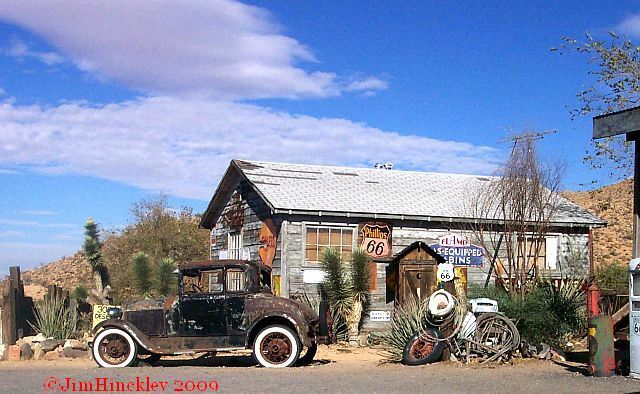 The circa 1930s general store, now a Route 66 icon, is its most famous attraction. In the late 1870s this was a town with a future looming so bright the territorial legislature even considered it a candidate for the Mohave County seat. However, the modern history of the site predates this by decades as Farther Garces camped at the springs here during his expedition of 1776.
the town itself goes unoticed. Most folks, us included, zip past Hackberry on the post 1937 alignment of Route 66 without a second glance at the town itself. Still, on occasion we will take the old road through town just to see what remains. 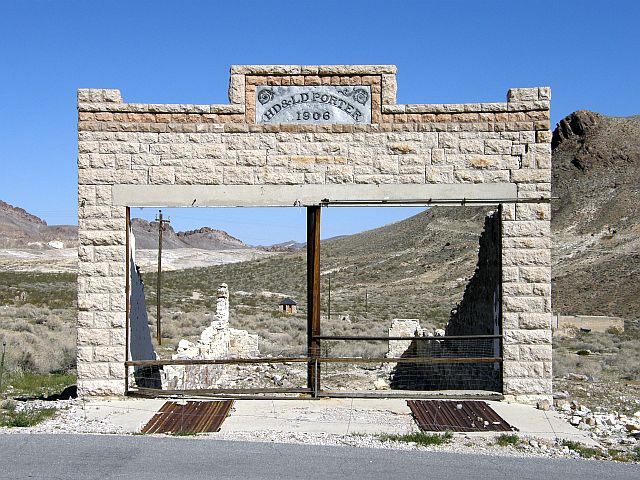 Rhyolite in Nevada represents the ultimate boom to bust story. From raw desert to modern metropolis in four years; train depots, multi storied buildings with elevators, a city swimming pool in the desert, a beautiful school, and a population of nearly 10,000 ensured any visitor would know this was a town that was going places. Four years later, in 1912, the population was numbered at 75 and coyotes had free reign in the empty streets. desert wilderness where a city once stood. Today the picturesque ruins of Rhyloite are some of the most haunting found in the desert southwest. As a bonus easy access on a paved road ensures it can be enjoyed by even the most cautious adventurer. On our recent excursion to document the ghost towns of Route 66, we discovered a few new additions for our favorite ghost town list. Quiet, empty Endee, New Mexico, a town of more than 150 people less than sixty years ago, was one of these. 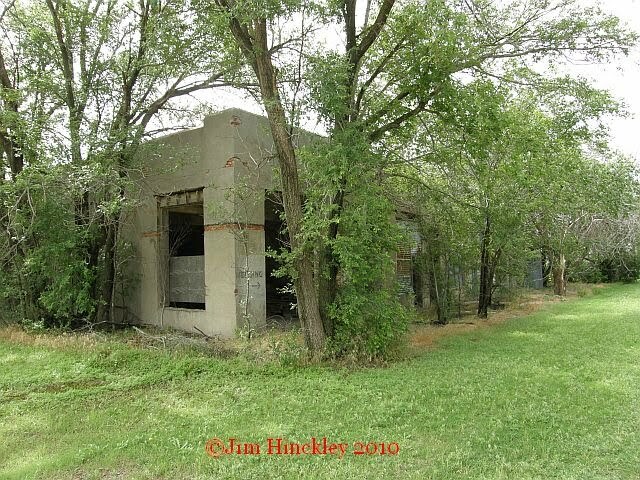 Often overlooked even by fans and enthusiasts of Route 66, Endee, located about five miles west of Glenrio, Texas has a serene, peaceful atmosphere that is difficult to describe. Perhaps it is the comedic relief that first greets the east bound traveler which sets the light hearted mood. Another charming discovery was Texola, Oklahoma. The vintage jail draws most of the attention but the vestiges of better times are plentiful here and they are best enjoyed with long early morning walks along the quiet streets. The reasons people seek ghost towns are as varied and unique as the towns themselves. For me it is the solitude, the tangible link to history, and a reality check that keeps me from taking life to seriously with manifestations of monuments to short lived dreams.